There is a pervading aspect of loneliness to our current age of personal media. It seems designed to close us off from the world while simultaneously opening us up to a wealth of new and amazing things. While there is real therapy to be found in putting in earbuds or slipping on a pair of cans to drown out the noise of the world, it is also a pointedly solitary affair. Listening to podcasts, however, presents a way to alleviate that sense of disconnect, allowing the listener to tap into the ad hoc communities that form around each program as it grows in popularity. In coming to terms with this satellite tribalism, illustrator and web comic creator Miranda Harmon created Harmontown, a beautiful piece of self-contained sequential art that taps into the intensely personal connection she developed for the Harmontown podcast. The non-comic Harmontown is that raucous hour of freewheeling nerdery from Community creator Dan Harmon, known for an intensely loyal following and its mix of blue humor, earnest emotionalism, and roleplaying games. 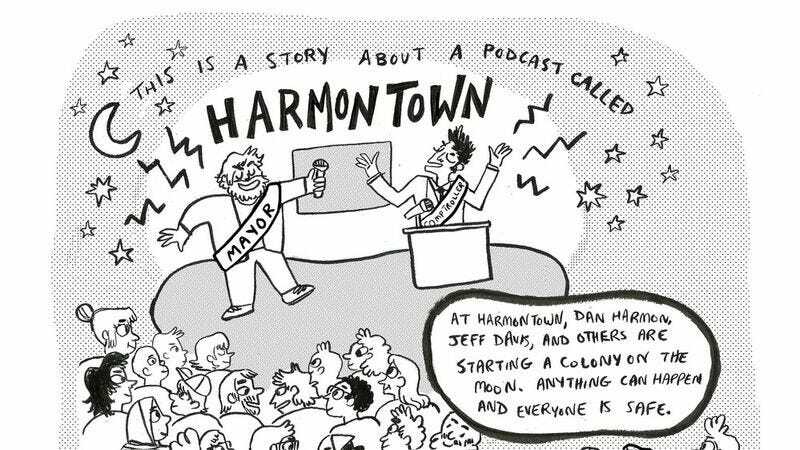 In the comic, Harmon—herself unrelated to the titular Harmontown host—explains how the podcast came to be such a special piece of her life, and how those feelings changed when she got too close to something she loved so unreservedly. It is a both a paean to and lament of the ways that we can come to form deep, emotional bonds with our favorite entertainments. There is a tone to the piece that suggests it is a form of catharsis for Harmon, but it is deeply moving for just about anyone who has found solace in pop culture during times of trouble. For her the podcast was as important as a close friend through tough times, but as she and the reader learn, there is also strength to be found in moving on. A curated selection of panels appear below, while the whole comic is available on Miranda Harmon’s website.